Creating a healthy and pup-friendly version of our favorite seasonal treats. Updated March 2019. I'll let you guys in on a little secret—I'm obsessed with Peeps. 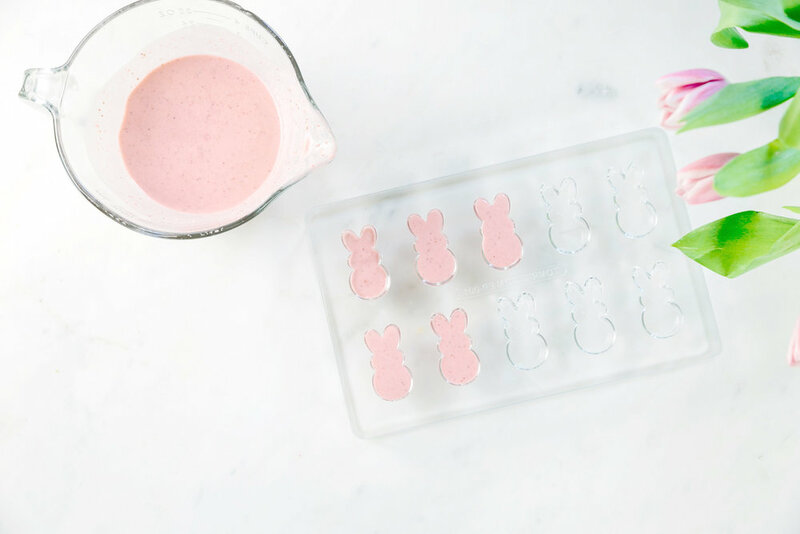 All of that to say, I wanted to give the pups a little Peep-magic this spring, so I came up with this healthy, pup-friendly Peep-sicles recipe. It's easy, healthy, and was a hit with both of our dogs. We found our bunny mold on Amazon and you can buy it here. It looks like it's low on stock, so there are also similar ones here, here, and here. Try these festive treats for a pup-friendly spin on an Easter classic. Makes two batches. Prep Time: 10 Minutes. | Freeze Time: Two Hours. 1) Combine frozen strawberries, peanut butter, yogurt, and water in a blender. Blend until mix is smooth and a little runny—like a smoothie. 2) Pour mixture into molds and place in freezer for two to three hours, or until Peeps are hard. 3) Remove tray from freezer and flip upside-down to remove. 4) Optional, dip a pin in dark blackberry jam to create eyes and nose. It can help to freeze again after this step. *Note: I used a hard polycarbonate tray, so if you used a silicone tray the removal process might be slightly different.